Past collides with present in this compelling book. I expect many people have someone they’d rather not meet again: a friend they fell out spectacularly with, a work colleague whose advances were shunned, an ex partner, a family member at the centre of a feud. For Lydia, that person is Sean. On the surface her life is going well and she has a happy marriage to loving husband Mark. She runs a successful wedding planning business, has two children at private school (even if they do have their terrible teens moments!) and she’s just been chosen to be chair of the school’s fundraising committee. She doesn’t get on brilliantly with her mother but other than that, life is pretty perfect. But Lydia has a secret from her teenage years which haunts her and she has spent 30 years keeping it hidden – even from Mark. 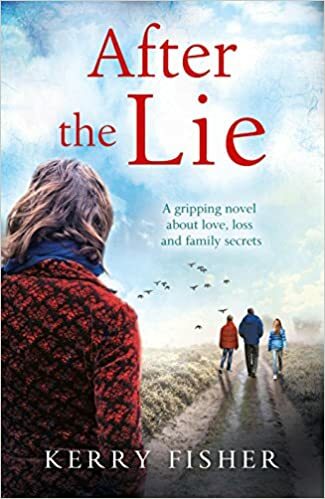 When, to Lydia’s disbelief, Sean turns up as a parent at her children’s school, she fears her life is about to unravel. I loved the character of Lydia and felt almost protective of her. I couldn’t imagine what was so bad that she had had to hide it away for all those years. And when the secret is revealed to the reader fairly early on, in the grand scale of things it isn’t really so bad. In fact it’s her mother’s insistence never to talk about ‘that business’ again that causes all the problems. In the pre-internet 1980s, Lydia’s ‘scandal’ would soon have faded away. But with Sean’s arrival in Lydia’s life again, I could feel my stomach, like hers, sinking. To Lydia’s horror (and mine!) her husband seems to be becoming friends with Sean and Sean’s wife is keen to befriend Lydia. And one thing after another makes it more and more impossible for her to tell Mark. As is the way with secrets, as we all know, they have a habit of getting out eventually with results no-one can predict. I was feeling really uneasy as I read on and it was obvious that the truth about Lydia was eventually going to be exposed. What was going to happen to her? How would her husband and children react? Well Kerry Fisher dealt with this emotional part of the story beautifully and I have to say I think the ending was just perfect. It resolved as I’d hoped it might but feared it couldn’t! Kerry Fisher has written a brilliantly gripping and believable story. She writes with such warmth and understanding and has created characters you will come to really care for – yes, possibly even Lydia’s mother who was only doing what she thought was right to protect her daughter. It’s a very well paced narrative as Lydia’s past comes to light and there are plenty of twists in the story to keep you turning those pages. I really couldn’t wait to find out what would happen next. I highly recommend this book of secrets, love and family relationships and look forward to reading more by Kerry Fisher.